Those who have already been enchanted by the Jardim Bôtanico, but are looking for a less popular venue, will find a tranquil paradise at Parque Lage. The small park at the foot of Corcovado Mountain was once the residence of the rich industrialist Enrique Large and his wife, the singer Gabriella Besanzoni. Surrounded by monkeys and birds hopping from branch to branch in the Atlantic rain forest, the park resembles an oasis and it is easy to see why the couple decided to settle down here. The mansion was built in the colonial style, but was later remodeled by Italian architect Mario Vodrelan and enclosed by a perfectly landscaped English-style garden. Today, the building hosts the Escola de Artes Visuais – the visual arts school – as well as a café, both of which are open to the public. Behind the turquoise pool in the courtyard, the wooden benches of the café and the embellished facade, Christ the Redeemer rises into the sky and creates the perfect backdrop for a day away from busy Rio. Apart from the nice view of the Christ, the delightful pastries at the café and the occasional exhibition or event, the Parque Lage also offers nice walks through the lush landscape with lots of things to discover. Visitors can enjoy fish tanks holding a variety of Brazilian species, admire fountains, ponds, caves and a tower and find plenty of benches to sit and take in the scenery. Parque Lage opens daily from 8am to 6pm and the admission is free. The public park can be found in the Jardim Bôtanico district along the Rua Jardim Bôtanico, where a number of busses make a stop. A flexible itinerary ensures a customizable experience during this private sightseeing tour of Rio de Janeiro. Your private group can choose to focus on nature or history, with either a driver-guide or a separate guide and driver. Visit Rio highlights such as Sugar Loaf Mountain and the Christ the Redeemer statue. Round-trip transport is available from any Rio hotel, port, or airport. Pricing is per group; admission fees are extra. 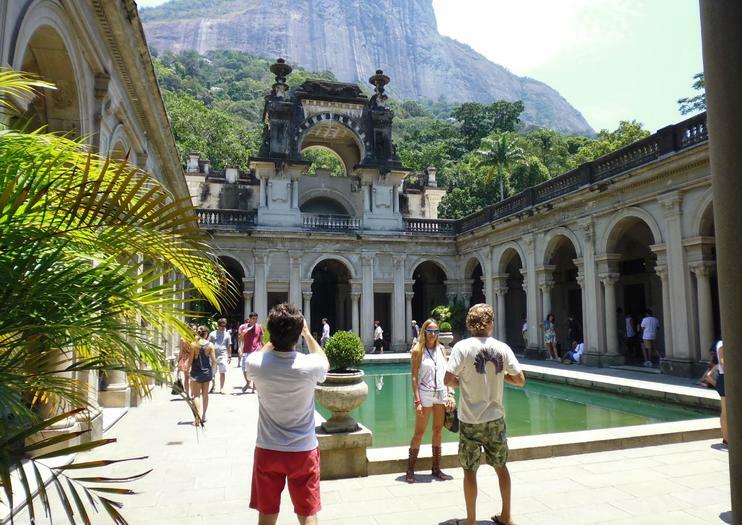 Visit the Rio de Janeiro Botanical Garden on this private, 4-hour photography tour. See the historic park with its diverse flora and fauna, plus the scientific research institute and garden trails. Then along with a professional photographer guide, travel to the historic Parque Lage. Wander through artificial caves, have a picnic and enjoy the natural beauty of the trails that lead to Christ the Redeemer, one of the seven wonders of the world. Afterward, receive a high-resolution digital photo album and a printed souvenir photo. Hotel pickup/drop-off included. Opt for a personalized experience of Rio de Janeiro on a private and customizable photography tour, a perfect introduction for first-time visitors. Traveling by SUV with just your party and private guide, you’ll create your own itinerary of Rio highlights and capture impressive photographs for your online portfolio. Plus, hotel pickup and drop-off are included to avoid the stress of finding a meeting point. Discover the UNESCO-listed Tijuca National Rainforest and famous Christ the Redeemer Statues on a 6-hour hiking tour. Start the moderate hike at Parque Lage, at the base of Corcovado Mountain, with your guide and a small group of 15 guests or less. Take in the aerial views from the top of the mountain and look out for local wildlife along the way. Immerse yourself in the art and fashion of cosmopolitan Rio de Janeiro on this guided 5-hour tour. Visit the Jardim Botânico neighborhood's Parque Lage, home to the Escola de Artes Visuais (School of Visual Arts), where free art exhibitions and occasional performances take place. Head to Ipanema, the epicenter of fashion and luxury, to tour the H Stern factory and get a look at the jewelry-making process. Round-trip transportation from Rio hotels is included. Hike up Rio's famous Corcovado Mountain for excellent views of the city and an up-close encounter with the Cristo Redentor (Christ the Redeemer) statue. Following an experienced hiking guide, make your way through the Tijuca Rainforest to the mountain's summit. This advanced trek takes about 2.5 hours, and the tour takes 6 hours in total. Round-trip transportation from Rio hotels is provided. You are free to choose the locations of the photoshoot, and I will make sure to have a specialised tour for your needs. I will ask you how you will want to use the photos and I take and edit them accordingly. The most unique about this photo shoot is that you finally don't have to worry about whether your favourite photos will make it to the final selection or not, because I will edit all the good (in focus, nobody ruins it in the background, your eyes are open, you are not talking or sneezing etc.) photos so you will be guaranteed to find photos that you absolutely love. Your Instagram will be done for some weeks and you can make your Mom happy too. :)Perfect for solo travellers or couples or friend groups! It is a tour of experience and contemplation, where the visitor will know Rio de Janeiro, not with the eyes of a tourist, but with the eyes of a legitimate Rio citizen!